The Cruz Control™ collar is a training product that is placed around the dogs neck as opposed to being fitted "over the head". This type of collar has a snap on one end, a floating ring, and a stationary ring on the other end. The snap is attached to the floating ring to create a training collar. Attach the lead to the stationary ring. 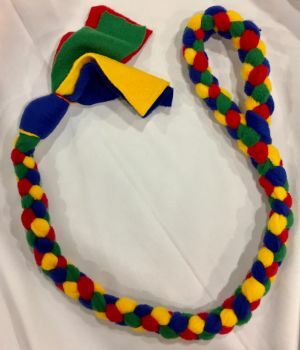 This collar allows a better fit, and should be sized to stay high up on the neck behind the ears. K9 Nosework and now AKC Scent Work has become a competition level sport. A fairly new and challenging sport. Nosework can be a fun activity for all dogs. K9 nosework instills confidence and focus for dogs while creating a fun activity for both dog and handler. 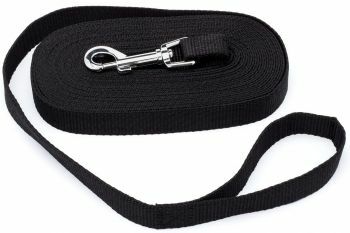 We've developed a complete line of Nosework leads for training or competition. Length from 6 feet to 15 feet. Widths in 1/4", 3/8" and 5/8" and materials ranging from Cotton to Nylon to Polyester. Available in black. Need another color or a special length, give us a call at 877-275-3332 and talk to one of our trainers. 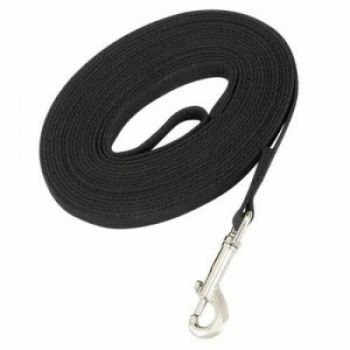 A durable nylon lead featuring a nickle plated swivel snap on both ends and a nickle floating ring to make it very easy to secure the dog to a wall in your training room, a tree or post. Designed initially for one of our clients, a professional dog trainer, who needed a method to temporally tie or clip a dog to a wall ring during class. Can be used indoors or out. Resists tangling, and will not mar furniture or woodwork. Very convenient when you need to hold a dog in place for a few minutes or are just taking a break. Available in an assortment of widths and colors. The Pawmark BAK-UP™ is a designed for trainers that utilize multiple collars on dogs in training. The BAK-UP™ is constructed from 100% USA Manufactured polyester for durable use. 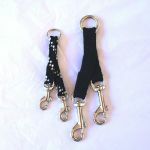 The BAK-UP™ allows you to connect the short couple to a prong or martingale type collar and the longer coupler to a flat buckle, slip or backup collar.